Next Up in Useful Outdoor Ads: Billboards That House the Homeless? Outdoor ads have been physically demonstrating a commitment to environmental causes for a while. Here's a project that aims to make a difference in a social issue. 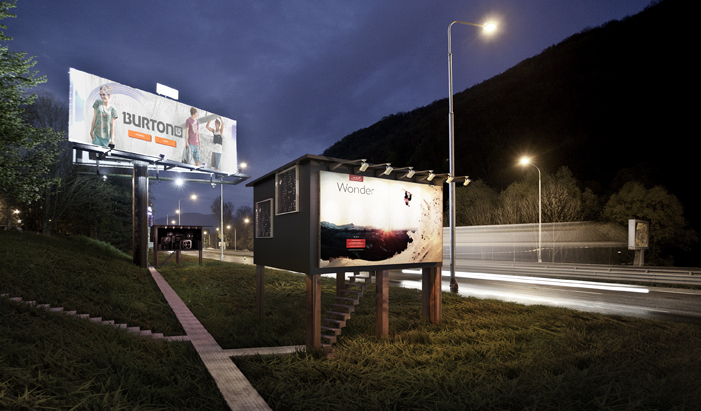 Design Develop, an architectural design firm in Slovakia, has embarked on The Gregory Project, an initiative to turn billboard spaces into actual living spaces for the homeless. Roadside boards in that country feature two surfaces that face oncoming drivers in both directions—creating a triangular space in between. The Gregory Project would build small two-room apartments in those spaces—one room with an entrance hall, kitchen with a small desk and a raised bed with storage underneath, and the other room being a bathroom. The ad space would help offset the cost of construction, and the houses would already be wired for electricity because of the lights that illuminate the boards at night. It's a great idea to optimize existing structures, especially when you consider the additions wouldn't infringe on the billboard. See more about the project here, including blueprints for the apartments. More images below.